Wouldn’t it be great if you could melt away fat in areas that are the most obvious? Dissolving fat seems something out of a futuristic movie, but the fact is, the technology and technique exist today. We at PSS are always looking for the innovative procedures that will help you achieve your goals. If you are bothered by your double chin, Kybella is one of those breakthrough products. It has been proven time and again that symmetry is one of the main characteristics of what we consider an attractive face. Facial features such as high cheekbones, full lips, prominent dimples and perfect skin, factor greatly into our criteria for beauty. One of the most important features is the strong, chiseled jawline– a sought after physical trait for both men and women. We see it on fashion models and Hollywood actors– it’s a feature that almost every attractive person possesses. It gives definition to the face and creates a streamlined look that everybody wants because we all want to look and feel beautiful. With time, pockets of fat can build up under the chin and around the jawline. This area, referred to by doctors as the submental fat compartment, plays a major role in the youthfulness of the neck and adds to the overall attractiveness of the face. That being said, people who have excess fat in these areas often suffer from low self-esteem, loss of confidence, and sometimes even withdraw socially. 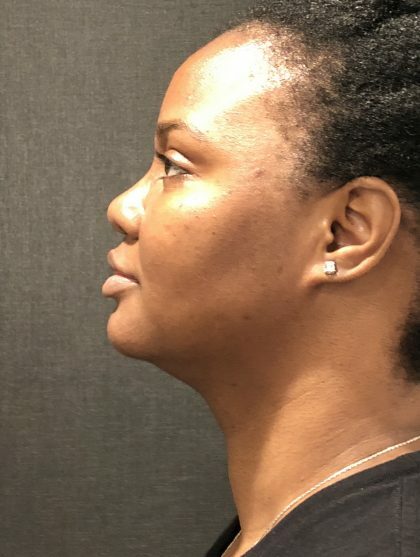 For these patients, a breakthrough product called Kybella is changing everything we used to know about treating the ‘double chin’. Before addressing solutions, it is important to explore what causes this condition. There are several factors that affect this area with regard to fat build up and aging. Some patients have excess fat under the chin even though they are not overweight. This can be hereditary, and even after weight loss, the stubborn fat can remain. It is common for some people to have diet resistant fat in areas on their hips, abdomen, cheeks and under the chin. These patients differ greatly from those with obesity related fat deposits, because patients suffering from obesity can see an improvement with simple weight loss. Patients who have hereditary fat deposits will see little or no improvement from diet and exercise. Before now, treatment of a ‘double chin’ involved anesthesia and complicated, often painful techniques. Everything has changed with the recent FDA approval of Kybella. This ‘magic’ injectable is the very first of its kind to be authorized for use in dissolving under-the-chin fat, which is a very significant step in non-surgical fat removal. Although Kybella hasn’t been approved to treat any other areas of the body, its FDA approval for under the chin fat shows that we are not far away from having injectable solutions at our disposal for treatment of ALL stubborn fat. Kybella offers a quick, relatively pain free treatment, with little or no side effects. It has so little downtime that it can almost be compared to other lunchtime procedures. Experts at the University of Texas SouthWestern Medical Center developed Kybella. In over 20 studies they performed, patients reported improvements, both physically and mentally, after treatment. This is great news and is part of the reason why the FDA was willing to approve Kybella, so that others could experience the same positive results with very little pain or downtime, seeing immediate positive changes in their daily lives. Kybella is a non-surgical solution for fat deposits below the chin, technically known as submental fat. Kybella is a non-human, non-animal formation of deoxycholic acid, which is a molecule produced naturally by the body which helps it to absorb fat. When your doctor injects Kybella into the tissue, you can expect that the treated area will not experience the accumulation of fat for years to come. This is due to the fact that Kybella actually degenerates and destroys the cells entirely. After the treatment, these cells cannot accumulate or even store fat, which is what makes it such a fantastic product. Unlike Botox and other injectables, Kybella results last for years, making it a noteworthy and cost-effective solution for patients who have these unwanted fat deposits. Through a process called cytosis, deoxycholic acid creates an imbalance in the cells, forcing excess water into the fat cells and eventually causing their membranes to burst. After they are destroyed, they are metabolized by the body and flushed out naturally. The improvement of facial shape and the youthfulness of your neck area aren’t the only results you’ll experience. Most see an improved self-image, more confidence, and an increase in social behavior. According to studies, 7 out of 10 consumers are bothered by under the chin fat. This does not mean that every person experiencing this condition will have the results they desire from a series of Kybella injections. Doctors report that patients with moderate fat deposits under their chin area see the most significant improvements, while patients with severe fat deposits due to obesity, see only a slight improvement. In fact, patients who have a generalized excess of fat can experience an imbalanced look from Kybella treatments, but this is to be determined by your doctor and results vary. The doctor will examine the area under your chin to determine whether you are a candidate for Kybella injections. In some cases, patients with sagging neck skin think that Kybella may be a solution for them. This is not the case and if you have sagging or loss of elasticity in the skin on the neck and below the chin, the doctor will recommend alternative treatments to Kybella, as it is specifically meant for patients with fat deposits under the chin. 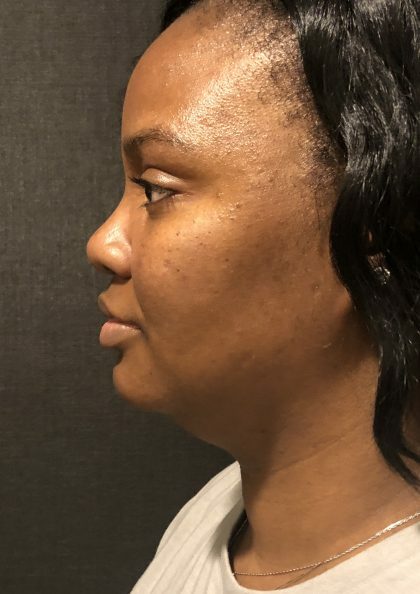 For patients with loose or sagging skin, Kybella would not have any affect on the skin itself but in combination with other therapies the fat may be reduced and skin elasticity improved. If you have excess chin fat, the doctor will determine whether it is a result of obesity only, in which case, he will inform you about what to expect after your treatment. Keep in mind that you may not see results as dramatic as may be expected if you are obese or significantly overweight. Although there will be some change, it will not be as noticeable as it is for patients who are not obese, but have stubborn fat deposits under their chin. At PSS, our aim is always to provide you with the clearest path to your aesthetic goals. Not only do we use cutting edge techniques such as Kybella, but have the experience to determine which is the best option for you. A successful treatment will usually require more than one treatment session. Kybella treatments are given at least one month apart as a rule. Naturally, patients with more severe fat deposits will be recommended more injections than those with moderate fat deposits. During your consultation, one of our trusted surgeons will spend as much time as needed to decide the best procedure to treat your submental fat deposits. After your procedure, you may experience mild swelling near and around the injection area. This is normal and subsides within a few days after treatment. Slight pain may also occur but is only temporary, with most patients experiencing relief after only one day. Immediately after the injection, the area will be red and feel a bit hot. For a few days following, it may feel like there is extra fluid in the area as well. This fluid absorbs over the days following. This technique is a commonly used way to remove fatty tissue from problem areas. It was approved by the FDA in 2006 and shows decreasing adiposity, quick recovery times, and even skin tightening. The laser treatment liquefies fat tissues and causes small blood vessels to group together resulting in a tighter look and feel to the treatment area. The CoolMini has recently been approved by the FDA and was developed by cosmetic company Zeltiq. They expanded upon their CoolSculpting technology and created the CoolMini to accommodate smaller areas of localized fat, such as the double chin. The compact applicator freezes fat at a specific temperature so as not to damage other tissue. The melted fat is then absorbed and metabolized by the body. a Necklift is recommended for patients who have loose or sagging skin under the chin area which cannot be treated by Kybella. During this procedure the platysma bands (neck muscles) are tightened, resulting in a sleeker, more contoured look. The cost of this procedure varies from patient to patient, as some will need more injections than others. Kybella is generally priced per vial , with 2-3 vials being used per session. A price will be determined after a consultation with your doctor. One thing to keep in mind is the long-lasting affects of Kybella. The fact that you will not need to re-treat the area for a number of years makes it quite cost effective in the long term.